The University of Idaho is committed to continual improvement of our events and the safety and comfort of our guests. In the interest of enhanced safety, we will be conducting bag checks at all the entrances for the Moscow commencement ceremony. Only small clutches and purses no larger than 4.5 inches high x 6.5 inches wide will be permitted for graduating students, faculty and staff participating in the ceremony. NO BAGS exceeding the size restriction will be permitted. Please leave unauthorized items in your vehicle; the University of Idaho cannot store or safeguard items that are not permitted into the Kibbie Dome. Guests declining inspection or in possession of prohibited items will not be allowed into the Kibbie Dome. Guests in possession of prohibited items inside the Kibbie Dome will be asked to leave immediately. A guest who does not leave when asked will be considered a trespasser. Guests who are disruptive during the ceremony will be removed from the stadium immediately and will not be allowed re-entry. Guests assume all risks and damages that may occur while attending the commencement ceremony. Please be courteous and remain in your seats for the duration of the ceremony. Do not block any aisles or walkways by attempting to greet or take photos with degree candidates. Pictures must be taken from your seat in the audience. For safety reasons and to honor the formality of the event, degree candidates are prohibited from bringing children on stage to accompany them as they receive their diploma cover. Space is limited on stage and there are no guard rails. Consideration of this safety hazard should be exercised in order to avoid any potential injuries. Anyone who sees anything suspicious should immediately contact a uniformed usher or the Moscow Police Department at 208-882-2677, or dial 9-1-1. In the event of an emergency, an announcement will be made to direct graduates and attendees to exit the Kibbie Dome in a safe and orderly manner. If such an event were to occur, please move to the nearest marked exit as quickly and safely as possible. 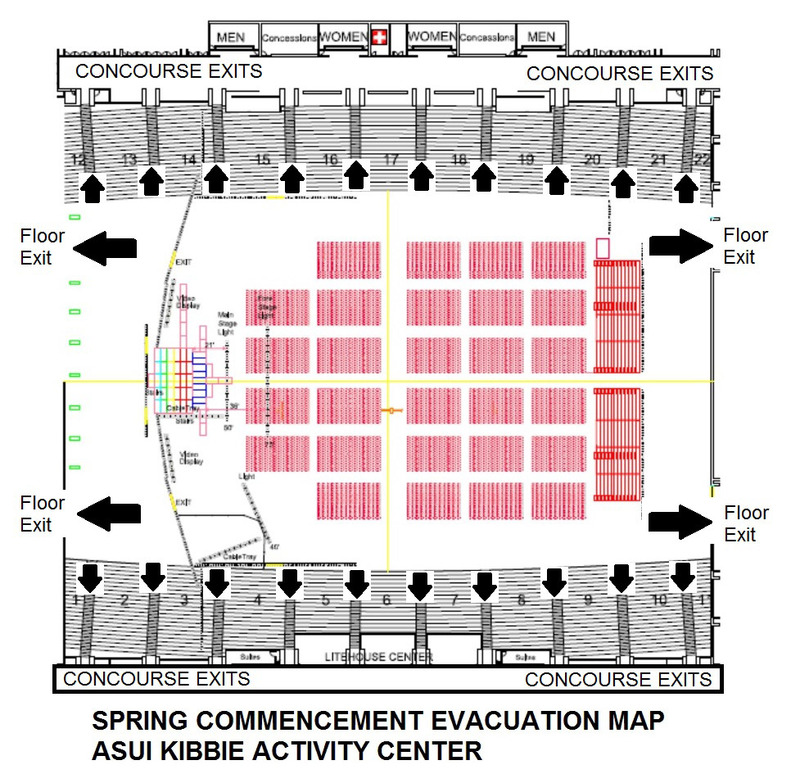 Once you have exited the Kibbie Dome, please use mobile phones to arrange to meet your graduate or family member.